The DeWALT 14-Pocket Professional Electrician's Tool Pouch features a flat bottom design to stabilize the pouch when placed on a level surface. There are 3 main pockets with 11 additional pockets, sleeves, and loops to accept a variety of tools, testers, parts, and connectors. Includes a steel hammer holder, snap hook, and electrical tape strap. ULTIMATE POWER AND INNOVATIVE SOLUTIONS. Quality tools and accessories that professionals depend on. Built tough to handle your most challenging tasks. Solid performance that makes short work of all your projects. Innovative products since 1924. Small Technicians Pouch. 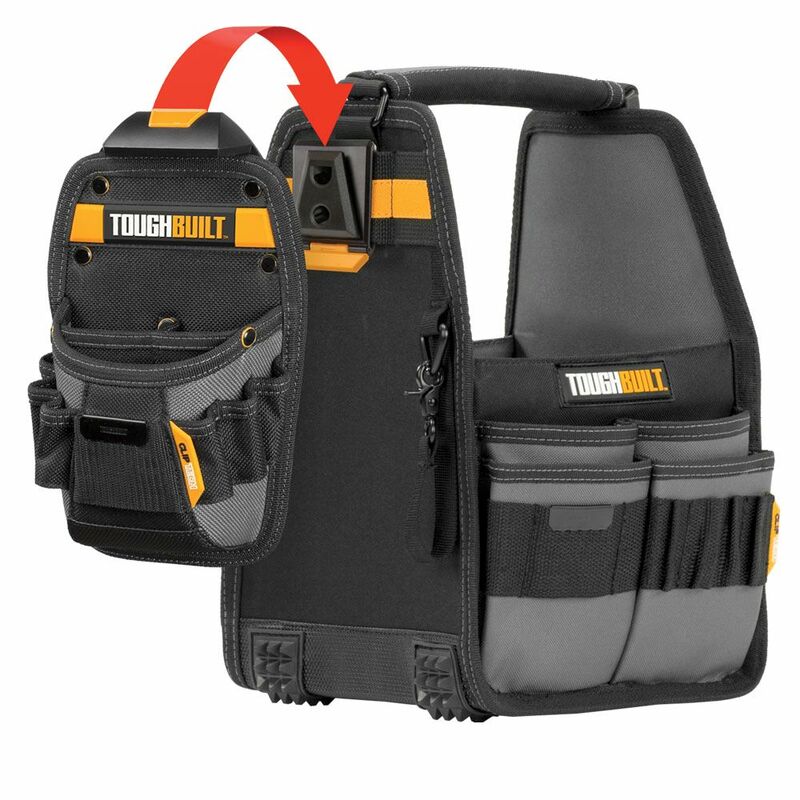 At home or on the job site, Husky tool bags are the toughest, most reliable soft sided tool bags available. The Husky electrician tool bag with the new innovative driver wall let's you store and organize all of your screwdrivers. Handle folds completely down for easy access to all tools. Carry your tools with confidence. The Husky cooler is the cooler you keep. This cooler will keep your items both hot and cold . Great for carry on luggage, outdoor festivals, races, concerts, camping and keeping your items cool on the go. You'll enjoy years of performance from Husky Cooler. 8 inch Tote + Pouch with ClipTech The ToughBuilt 8 inch Tote + Universal Pouch with ClipTech is an ideal set for DIYers and service professionals alike. The ClipTech innovation gives professionals the never-before option to effortlessly adjust and interchange pouches. The Universal Pouch quickly clips onto any belt and onto the tote itself, efficiently adapting to every job at hand. Its 31 pockets include structured external pockets that flex to securely hold tools in place and internal dividers to keep everything organized. It features a quick release handle for superior visibility and accessibility. Made with high-quality rugged materials, heavy-duty rivet reinforcement and high-impact clawed rubber feet this hard-working combo keeps up with the most rigorous demands. 8 inch Tote + Pouch with ClipTech is rated 4.5 out of 5 by 13. Rated 2 out of 5 by jeff from Although a very good size bag with the proper amount of pockets. I find that the structural integ... Although a very good size bag with the proper amount of pockets. I find that the structural integrity is not so good and the bag seems to tilt to one side making it difficult to get the tools out one handed.